Monday marked the start of the 4th Annual Summer Edition of Clayton Restaurant Week (CRW), one of the city’s most popular annual events. This year’s lineup includes 15 restaurants, each offering a special $25 or $35 three-course dinner promotion. “You get a lot of first-time diners, a lot of people that normally wouldn’t venture into Clayton,” said Ryan Krassinger, general manager for 801 Fish. Last year, more than 13,000 people attended CRW, spiking business up to 200 percent compared to normal July sales. 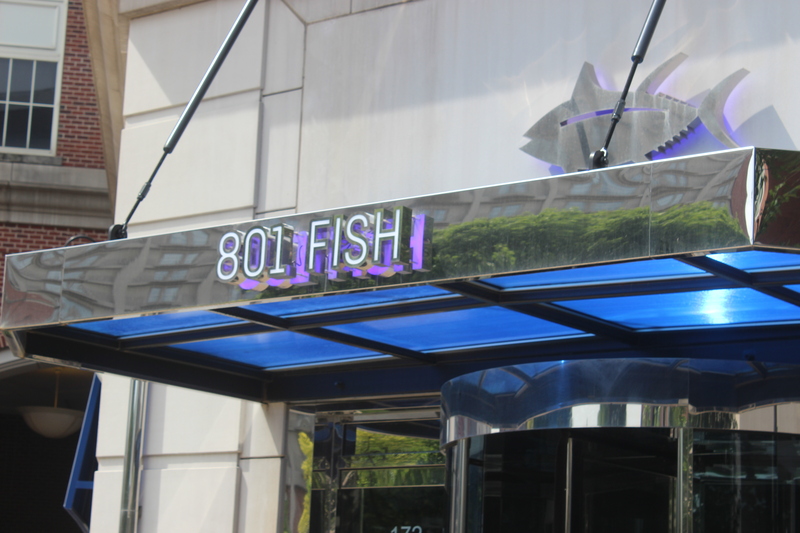 Like other participating restaurants, 801 Fish will offer special menu items just for the week. The upscale seafood restaurant will serve barramundi, an Asian sea bass, through July 16. “Typically, our menu is $40 or $50 dollars for an entrée, and you can get three courses for $35 during Restaurant Week,” Krassinger said. The opportunity to try high-end restaurants doesn’t stop at 801 Fish. For just $35, Herbies is offering escargots, lobster mac n’cheese, and crème brûlée as course options. Patrons of Clayton Restaurant Week also have the option of adding a $5 donation to their bill. Contributions will benefit Operation Food Search, a St. Louis area food bank. Last year, nearly $6,000 was raised. The promotion runs from Monday, July 10 to Sunday, July 16. For more information, visit www.claytonrestaurantweek.net. make it important. A lot more people should check this out and understand this side of your story. Also, The contents are masterpiece. you have done a fantastic process on this topic! Hello terrific website! Does running a blog similar to this take a lot of work? however I simply wanted to ask. Thank you! May I simply just say what a comfort to find someone that actually knows what they are discussing on the internet. come with approximately all significant infos. I would like to look more posts like this . It’s always helpful to read through content from other authors and use a little something from other sites. Hi there great blog! Does running a blog like this take a massive amount work? This paragraph provides clear idea designed for the new visitors of blogging, that actually how to do blogging and site-building. It’s not my first time to pay a visit this website, i am browsing this web site dailly and get pleasant data from here daily. inside and it pinched her ear. She never wants to go back! LoL I know this is totally off topic but I had to tell someone! out more. Thanks for wonderful info I used to be searching for this info for my mission. though you relied on the video to make your point. You definitely know what youre talking about, why waste your intelligence on just posting videos to your site when you could be giving us something enlightening to read? early in the daylight, as i enjoy to learn more and more. make sure to do not disregard this web site and give it a glance regularly. I simply want to mention I am just newbie to blogging and site-building and really loved you’re web blog. Likely I’m want to bookmark your website . You absolutely come with impressive writings. Thanks a bunch for sharing with us your web site. with spelling issues and I in finding it very troublesome to tell the truth then again I will surely come again again. extensive for me. I’m taking a look ahead for your next put up, I’ll attempt to get the dangle of it! like to understand this topic. You know so much its almost tough to argue with you (not that I really would want to…HaHa). After looking at a number of the articles on your website, I honestly appreciate your technique of writing a blog. you’ve performed a magnificent process in this matter! know if this is happening to them too? This may be a problem with my internet browser because I’ve had this happen previously. Thank you for some other fantastic post. Where else may just anyone get that kind of info in such a perfect manner of writing? I’m extremely inspired with your writing abilities as neatly as with the structure for your blog. I am requesting for my mother. She does not necessarily wish to make money off them, her objective is to use her blog (once popular) and use it as references to perhaps assist her obtain a news article. She has a title for one called “Response to Life’s Issues”. Where can she upload blog sites and they end up being prominent? She posted it currently on WordPress however there are 3 million people publishing blogs hers gets shed in the mix. Any type of suggestions?. digg it and individually suggest to my friends. I’m sure they’ll be benefited from this website. Keep up the great work! You already know, lots of individuals are looking around for this information, you can help them greatly. discussed here? I’d really like to be a part of group where I can get responses from other knowledgeable individuals that share the same interest. Your way of describing the whole thing in this paragraph is really fastidious, all can simply know it, Thanks a lot.